The Kalahari Desert isn’t exactly the place you’d picture watermelons growing, but surprisingly, Kalahari melons grow all across the desert. Also referred to as wild watermelon the African Citrullus lanatus species is an ancestor of the watermelon that most of us are familiar with. However the fruit of the Kalahari Melon is bitter and not at all like the sweet watermelons we enjoy. These ancient desert melons provide a critical water source for the nomadic San people. During the dry season, they can live up to six weeks relying on nothing but melon for food and water. The San tribe have used the oil to protect themselves against the desert-dry climate and scorching sun for thousands of years, making Kalahari Melon Seed one of the first skincare ingredients. Kalahari Melon virgin oil has a golden yellow appearance with a mild nutty aroma. 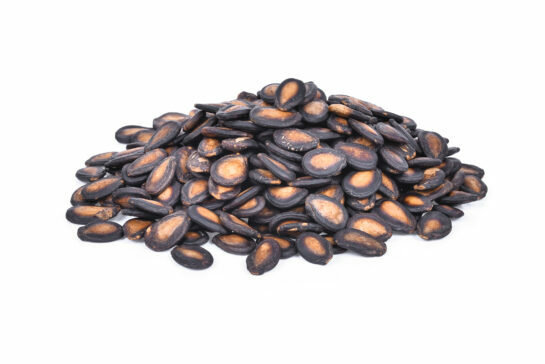 The seeds oil content is about 51% and has some key properties. The oil has an omega-6 fatty acid content comparable to that of evening primrose oil, making it an ideal ingredient in skincare formulations. It has natural moisturizing and emollient properties in addition to being a natural cleanser. It can be used at 1% – 100% in cosmetic formulations. Kalahari melon oil also has a high sterol content with nearly 2% unsaponifiables. This includes β-sitosterol, campesterol, stigmasterol and 5-avenasterol. In comparison, the skin’s stratum corneum has a significant sterol component (14% of lipids). The oil is highly stable to oxidation. This is primarily due to the high γ-tocopherol (Vitamin E) content (70mg/100g) and the phenolic acids that are present – gallic, protocatechuic, vanillic, syringic, ferulic and caffeic acids. Sustainable – The biology of the Kalahari Melon means it is sustainable. The Melon can be planted and harvested in underutilized, arid land to meet demand each season allowing for a more elastic supply and without doing long-lasting damage to the environment. The Kalahari Melon is also very drought resistant, as it evolved in the desert over millions of years, and has, therefore, become a source of income to remote communities in Africa. Ready to use this amazing oil? Check out this recipe for dual purpose brow and eye area oil. The eyes are the window to the soul, but the eyebrows frame the face and express emotion most visibly. Keeping the brows well groomed and the eye area well-nourished helps us look our best even when we aren’t feeling our best. This dual-purpose oil blend serves as a way to groom and smooth the brows while deeply nourishing the delicate skin around the eyes! Buy all of the ingredients needed here – Dual Purpose brow and eye area oil ingredient kit. Simply blend all ingredients together and add pour into roller ball bottles. Apply to brows and eye area anytime! Please note that this recipe has not been challenge tested for preservation efficacy. If you use this recipe for market sales, it is up to you to ensure the safety of the product. We strongly recommend 3rd party challenge testing. If you need additional help, please contact us at info@ewlnatural.com or 866-252-9639.